You've never played a hunting game like this before! Hunting Unlimited™ 2011 is an all new game with state of the art graphics and animal animations so real you can almost hear them coming! 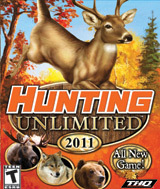 Jump into the action with Hunting Unlimited™ 2011: hunt your way across the 50 great states in two exciting challenge modes - breathe in the fresh air! Trophy animals await - are you skilled enough to bag them? Go for the trophy kill in 2 new, expansive game modes - Stand and Stalking.